This mountain bike adventure in socalled Central Asia’s Switzerland starts in its capital Bishkek, a natural green city where time seems to have stopped. Next, several days of mountain biking will take you over high mountain ridges and through elongated valleys, so characteristic for Kyrgyzstan. There is hardly any tourism, but its people are very friendly, accessible and interested to meet foreigners. The original population of the country are nomads, but in these days most people spend their winters in warm houses. During the summer season they take their herds of yurts (a national species of deer) to the highland valleys. Here they lead again their nomadic exsistence in tents, that are only felt sheet covered wooden skeletons. The downfall of the former Sovjet Union has certainly left its effects on Kyrgyzstan, a former member state of the Russian republic. There is hardly any industry left and the lack of natural resources doesn’t provide any alternative sources of state income. In the last twenty years the mining industry has been neglected and the small mining villages high up in the mountain have become abandoned. The mountain bike takes us to one of the largest attraction of Kyrgyzstan: the natural reserve surrounding the Issy-Köl Lake at an altitude of 1600 m. It is situated between de mountain ridges Küngey Alatau and Terskey Alatau. The lake used to be a testing site for Russion submarines firing their torpedos. Of course the area then was strictly forbidden for foreigners, who didn’t catch any glimpse of the thousands acres of poppy plants yielding to a big harvest of opium. Departure on July 5, 2020! Duration: 22 days, including 18 days mountain biking. A bus transfer from Bishkek airport will bring you to the shores of the Dzhailoo River surrounded by picturesque mountains with glaciers rolling down the slopes. 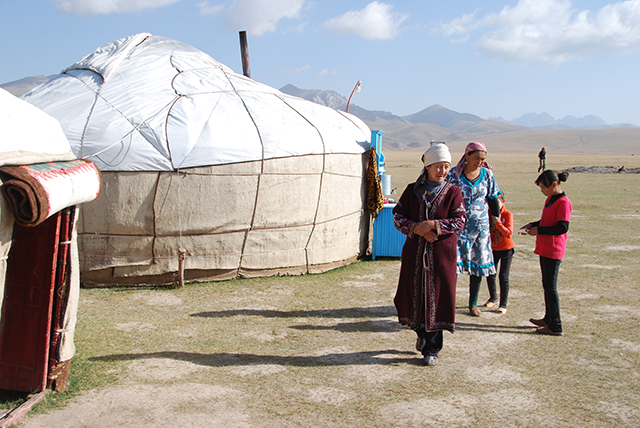 You will stay overnight in the famous yurts: felt covered tents used by nomads and giving room to 4-5 people. The time before and after dinner allows for getting used to the climatic condition here at an altitude of 3795 m.
After breakfast the first stage of our Mountain Bike Challenge starts: a 25 km track along the Tez Tor Pass takes us to our lunch site at the Kegeti Pass, 3850 m high up in the mountains. Following lunch a 40 km mountain bike trip finishes in Dem Alysh at an altitude of 3780 m. Dinner is served here after which today’s program ends with a good night’s rest in tents at a local campsite. Following the ‘energy-intake’ during breakfast the final destination of our mountain bike tour today will be Chaar Archa Pass, at an altitude of 3061 m. Along the way lunch is served after 60 km, while in the afternoon we will cover another 25 km over stony and dry, dirty roads towards Chaar Archa Pass. We dine and stay overnight at a campsite. After breakfast, today’s mountain bike tour takes us over partly paved gravel roads. We reach the starting point of the Kara Keche Gorge, some 40 km further down the route and cover the same distance along a challenging track down in the gorge that afternoon. We stay overnight at a campingsite 2684 m high up in the mountains. The first 20 km of today’s mountain bike tour will bring us to the Kara Kech Pass, where we experience an immense spectrum of colours radiated by the magnificent landscape. Lunch at an altitude of 3384 m is followed by another 30 km mountain biking to the southern shores of Son Kul Lake. We stay overnight in traditional yurts some 350 m lower down in the mountains. Today’s 60 km mountain bike tour takes us tot he northern shores of Lake Son Kul. More than 18 smaller rivers flow into the lake with just one rising from there: the Son Kul River. At its shores we enjoy lunch today, followed by views on the natural beauty of this vast landscape, containing extensive green pastures where nomads herd their cattle. Although the winters can be very harsh here, the present season offers nice juicy grasses for the many horses, sheep, goats, cows, yaks and even cemels. Sunsets are undescribably beautiful here, more than worthwhile to ejoy! 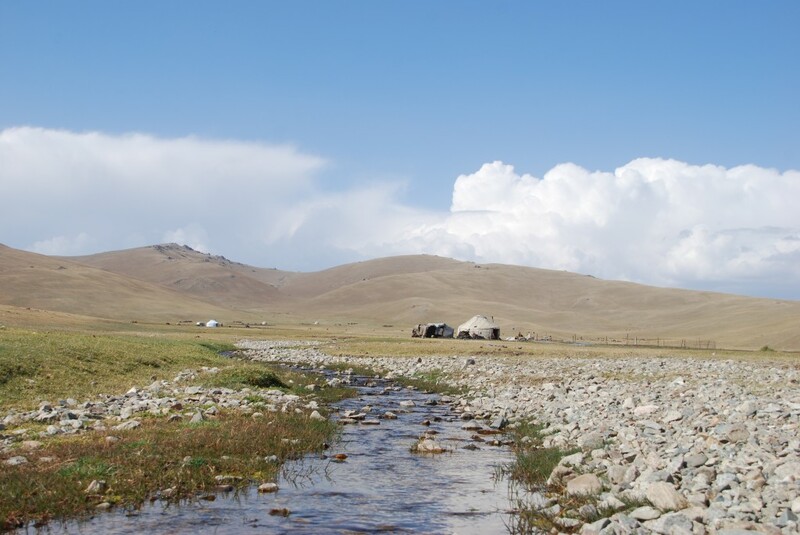 We stay over in traditional yurts at an altitude of 3034 m.
Today’s program entails a beautiful 90 km mountain bike ride through the Teskei Torpu Pass, from where we descent to Naryn at an altitude of 2020 m. Here we dine and stay overnight in a guesthouse. 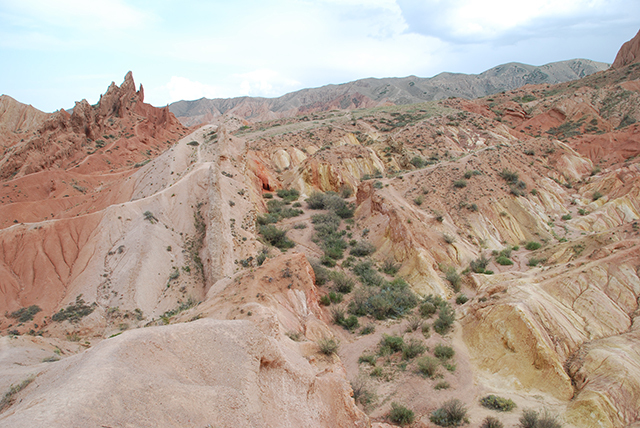 Today the beautiful natural surroundings lead us from Naryn to Eki Naryn over a distance of somewhat more than 50 km, while our mountain bike tracks require only some climbs and slopes going down. Hence, after having covered slight differences in altitude we dine and camp overnight, some 2250 m high up in the mountains. Following breakfast we mountain bike 50 km through uninhabited territory to Oruk Tom, at an altitude of 2725 m. Here we stay overnight at a campsite. 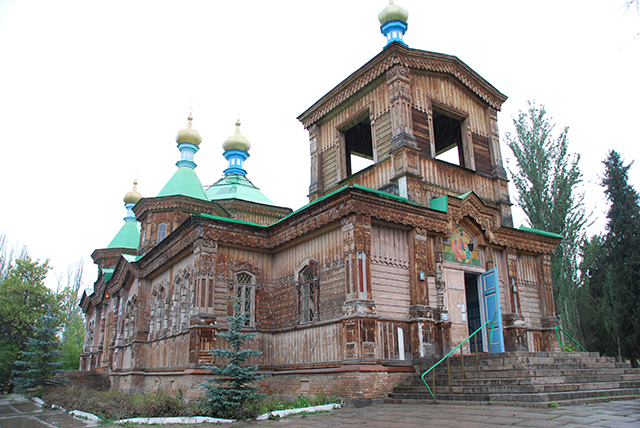 After having enjoyed breakfast a 65 km off-road mountain bike tour via Archali will take us to Jiluu Suu Hot Springs. Along the way we will have lunch, followed by some additional tracks in the immediate vicinity. We enjoy dinner and will stay overnight in tents at a campsite 3000 m high up in the mountains. The first 35 km of mountain biking today will bring us to the Posor Pass to enjoy magnificant views on the surrounding mountain slopes. It requires quite some technical skills to ride our mountain bikes through this Pass: small paths with some ice and snow covered areas, challenging us all to really watch out! Following this tricky track we stop for lunch. 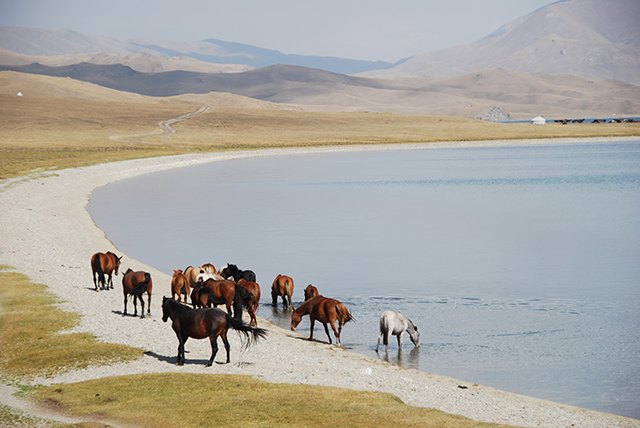 In the afternoon today’s final 45 km takes us to the southern shores of Issyk Kul Lake to the village of Tosor. Here we enjoy dinner and stay overnight in traditional yurts at an altitude of 1620 m.
After breakfast we take our mountain bikes to Skaza (Fairy Tale) Canyon, owing its name to the typically wind shaped rock formations showing silhouettes of the Great Chinese Wall, dinosaurs, castles, snakes and dragons in the most impressive spectrum of colours. When time allows a swim in beautiful and clear natural lakes nearby is an option. Again we stay overnight in traditional yurts. Following breakfast, a bus transfer will take us to Karakol. Here we enjoy lunch and continue with a 40 km mountain bike ride through coniferous forests with many hidden cold and hot springs. Beautiful natural surroundings give rise to the 5000 m high peeks of the Ak Suu mountain ridge with may ravines and spectacular abysses. Today’s trip ends at a camoing site within the Arashan Gorge, 3000 m high up in the mountains, where we dine and stay for the night. Today’s breakfast is followed by a 60 km mountain bike tour through the Arashan Gorge up to Kok Kiya. Along the way we will enjoy lunch, after which the afternoon trip brings us to Kiya’s campsite at an altitude of 2761 m.
The mountain bike tour of this morning leads us to e 3822 m high summit of Kok Kiya Karakyr Pass. Here we will enjoy a magnificent view of the Tien Shan Mountain Range. A campsite here provides comfortable sleeping arrangement for the night. After breakfast we mountain bike to Engilchek, a small village in the Ak Suu District situated in the southeastern part of the province of Issuk Kul. 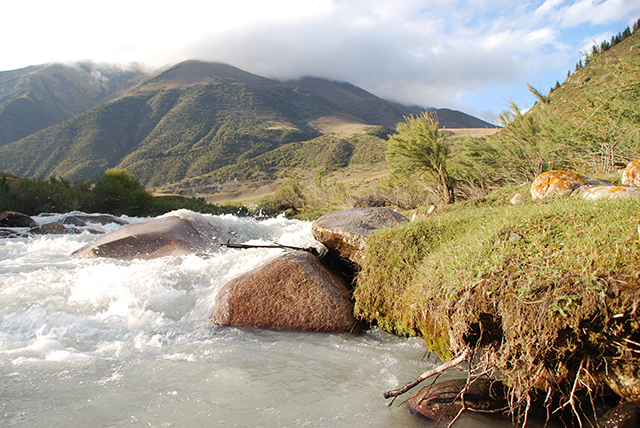 Engilchek is located on the shores of the Saryjaz and the Engilchek rivers. After the local mine closed down here, its population decreased dramatically from 5000 to 20 inhabitants. Rumours go that in 1991 a UFO crashed here. Today’s 70 km mountain bike tour has led us to a campsite, some 2500 m high up in the mountains. Today’s program brings us the second last mountain bike ride of this Challenge. During the 40 km mountain biking we climb from 2500 to 4000 m to Boom Gorge and the subsequent campsite to stay overnight. Leaving the Boom Gorge our very last mountain bike tour takes us along a 40 km track to Maidadyr, descending from 4000 to 2500 m. At this altitude we stay overnight at a campsite. No mountain bike tour today, but a beautiful 180 km bus transfer to Karakol. Along the way there is ample opportunity to swim and enjoy lunch. Dinner and overnight stay in a guesthouse. Following breakfast this morning’s bus transfer will take us back tot he capital Bishkek, some 400 km further down the road. Along the way we stop at the Burana Tower, dating back to the 11th century and located closeby the old city of Balasagun, capital of the former ancient state of the Karahanides. The Balasagun ruins form an important tourist attractions and we too will enjoy dinner and our today’s overnight stay here in a guesthouse. After breakfast a bus transfer will take us to Bishkek Airport for our international flight back to The Netherlands. To apply for a visa you need a passport, valid for at least 6 months following departure to Kyrgyzstan.